There’s more to golf cars than carrying clubs. Our carts can be equipped with a wide variety of accessories to fit any need. From rear seats and custom dashboards to lift kits and vinyl enclosures, we have just the right accessories to meet the job, or to add a little flair. Colerain Golf Car Sales sells parts for EZGO, Club Car and Yamaha models. If we don’t have a part in stock we can usually get it in for you in 3-5 days. » View the E-Z-GO Accessories Catalog! Need a more personalized vehicle? 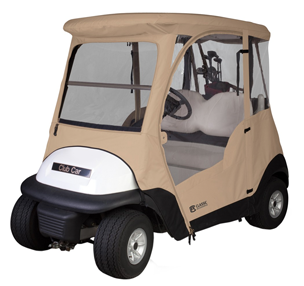 We also offer complete customization services for your golf car. » Click here to view our Customization Gallery!